We’re all about the handmade decorations this year! 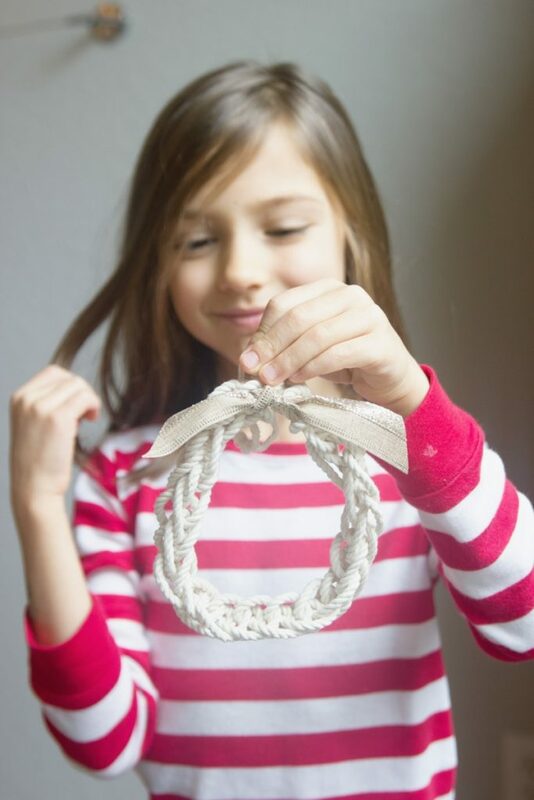 This super easy finger-knitted wreath took five minutes to make and would be a great addition to any Christmas tree or as a sweet gift. I used to be the crafty mom doing all the cute Pinteresty kids crafts, but I’ve changed my tune during the past year. There is absolutely nothing wrong with typical kids crafts. And you better believe we will certainly stick a handprint on something this holiday season for posterity! But I’ve been trying to find more meaningful ways for us to create together. The concept of handicrafts is that children work on crafts to develop skills to support and enable the child as he grows to adulthood. Handicrafts have a useful and beautiful end product versus typical crafts that mostly become clutter and tossed in the recycle bin after a time. This school year, my 6 year old has learned so many skills that she will carry with her through to adulthood. We have done watercolor painting for handmade cards, she embroidered felt bookmarks for her friends’ birthdays, and is making beaded wind chimes for Christmas gifts. 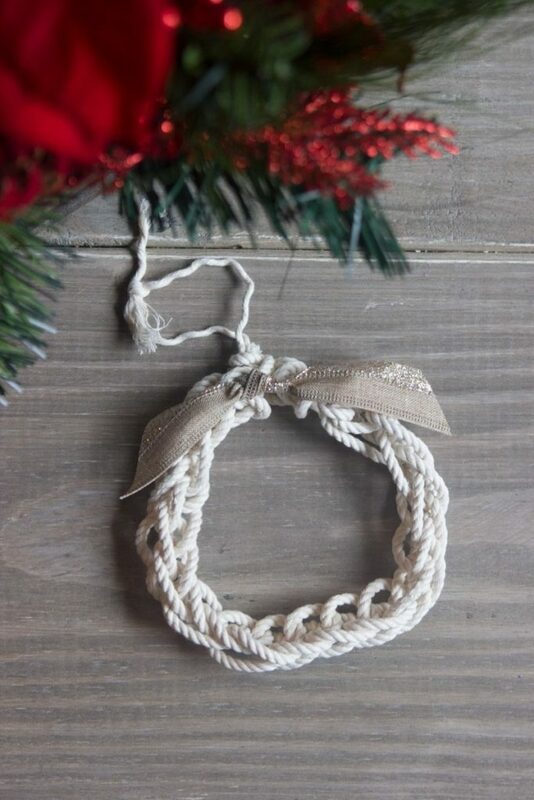 In our quest for more handmade decorations, we came up with this easy finger-knitted wreath ornament. Finger-knitting is exactly what it sounds like-knitting with your fingers! No needles or extra tools required. Just your own hand and some yarn or string. 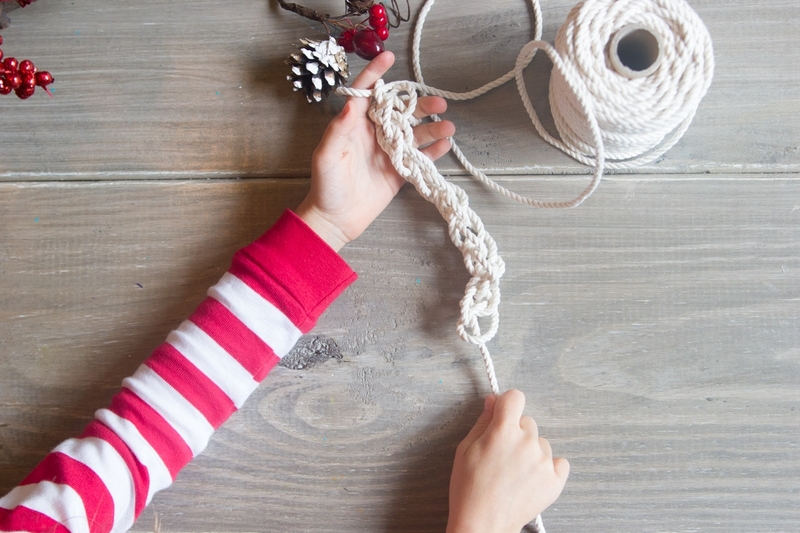 Finger-knitting is an awesome skill that is perfect for kids and adults alike. It’s cheap, portable, and can be done alone or in a group. 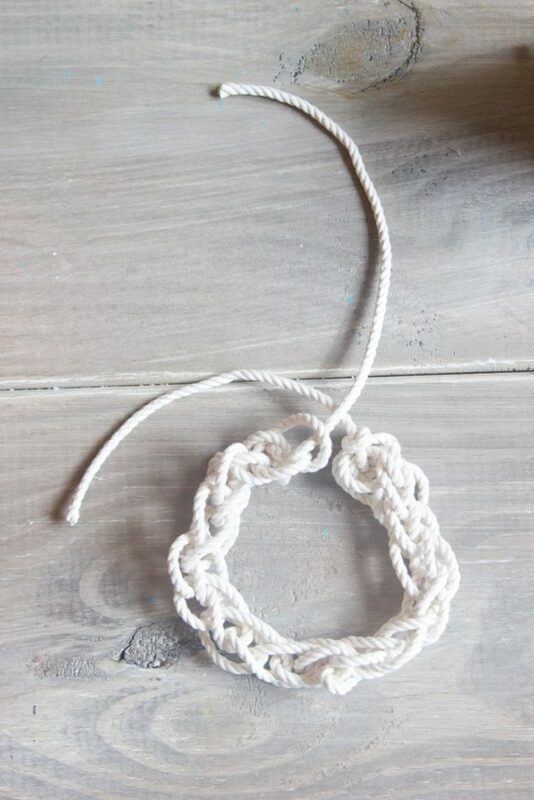 We learned to finger knit with this tutorial. Finger-knitting does take some dexterity, but I would say most 5 year olds would be able to finger-knit with help. 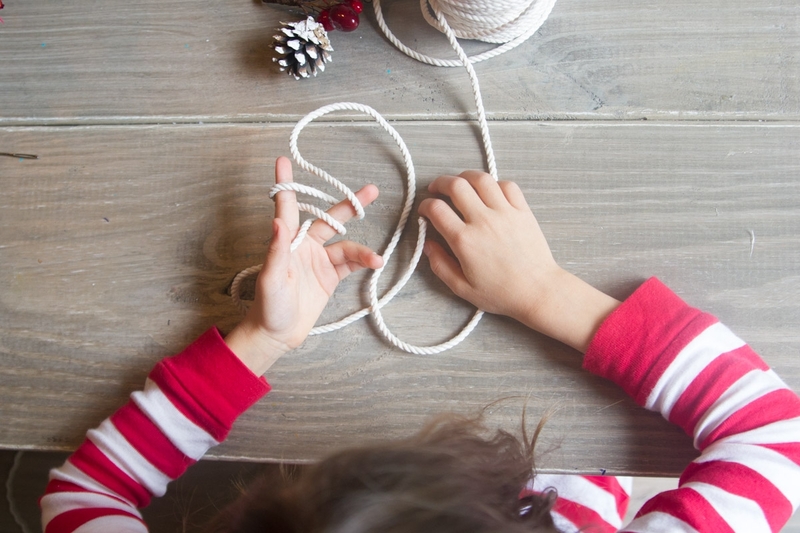 For younger children, finger-knitting with less fingers can be a good way to start. Here’s a tutorial on finger-knitting with two fingers. 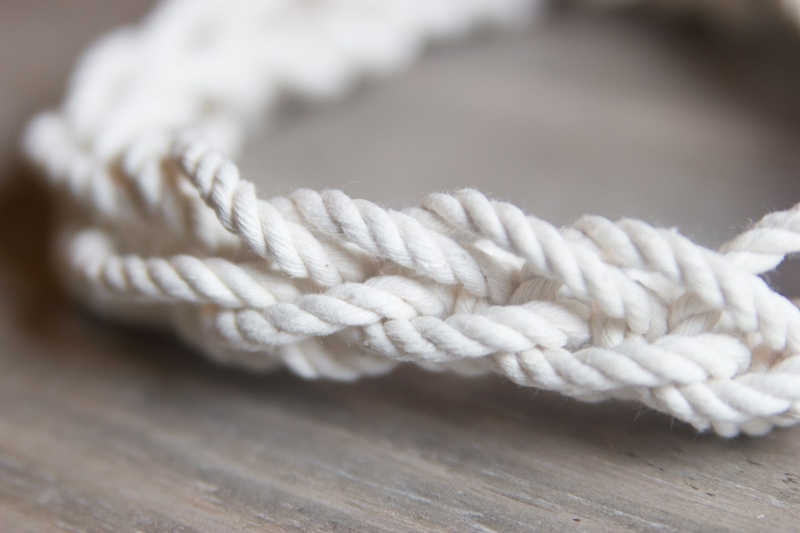 A note on the choice of rope: I wanted a chunkier rope to get this look, but it can be done with plain ol’ yarn or any size rope or cording. The thicker the material, the more challenging it will be for little fingers though, so keep that in mind. Start by finger-knitting a length of about 6 inches. You can adjust the size depending on how large you want your ornament to be. 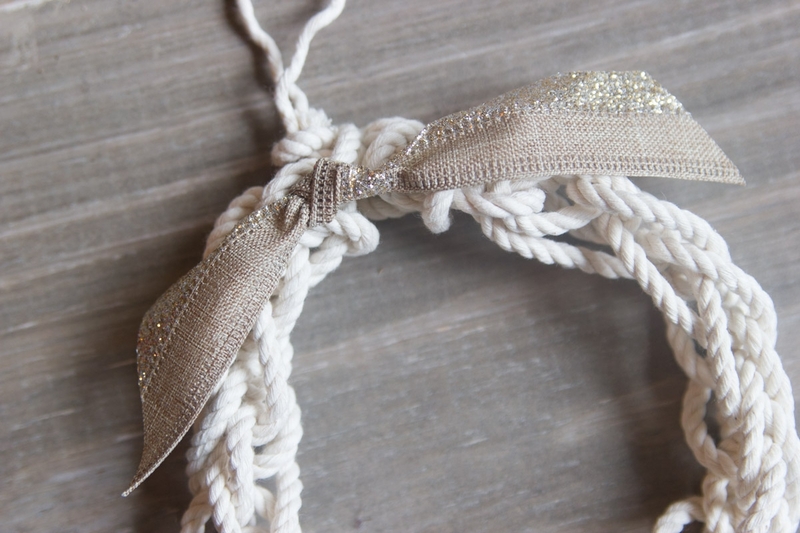 Once you have the desired length, tie off the strand as instructed in this tutorial and cut the rope leaving enough extra to create a hanger. 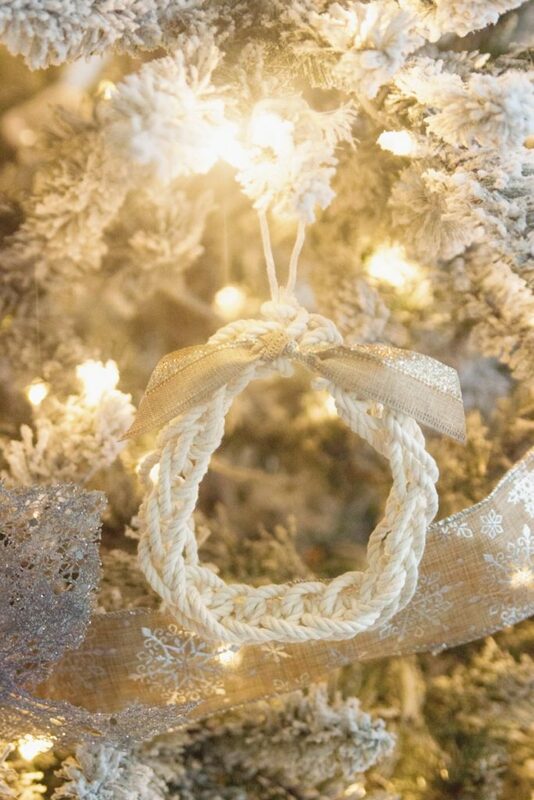 Join the two ends together to make the wreath shape, and tie a simple knot. 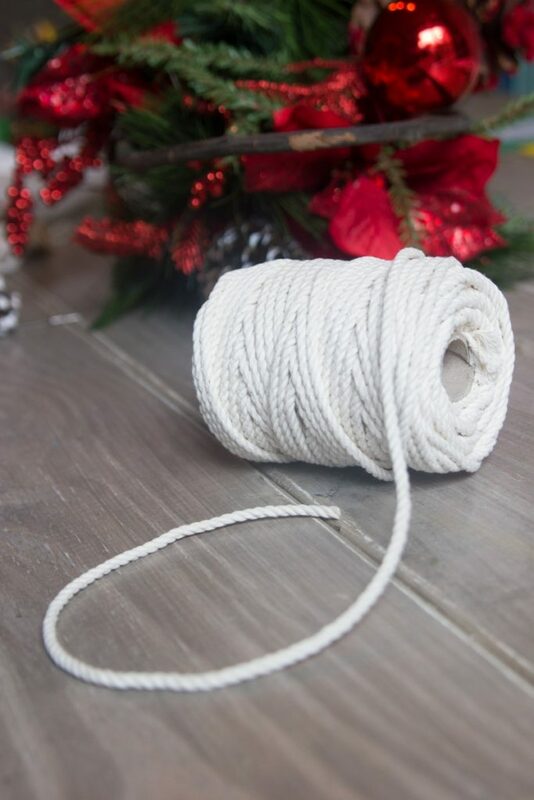 Use a length of ribbon to make a bow. I have zero bow skills, so feel free to get fancier here. 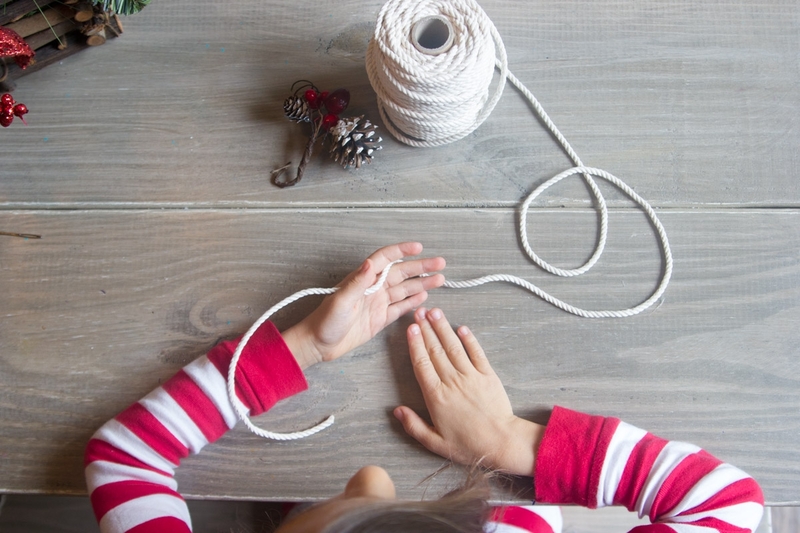 Tie the loose ends of the rope together to make a hanger. Hot glue the bow on to the top center of the wreath. And that’s it! Make them for your tree, make them for teacher gifts…finger-kintted ornament treats for all! P.S. You can find my daughter’s Christmas jammies here. And P.P.S. I am hoping to learn to knit with needles soon and I’m loving this Ultimate Beginner’s Guide to Knitting!